CHANTHABURI, THAILAND-OCTOBER 1, 2018: People travel to visit The Cathedral of the Immaculate Conception is a Catholic church and is located in the city of Chanthaburi province in southeast Thailand. 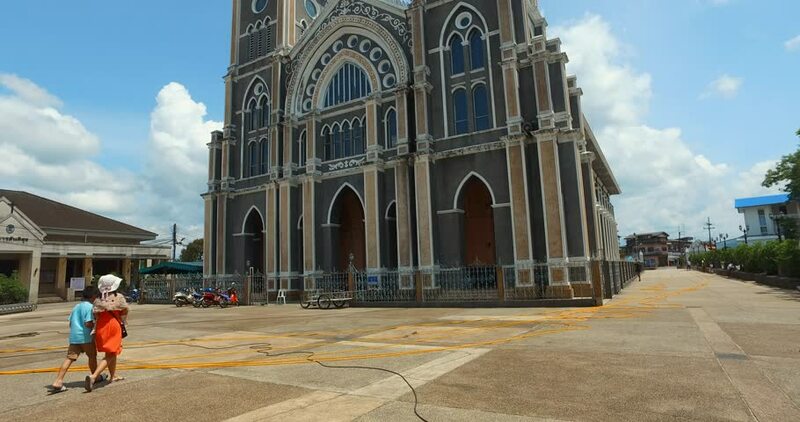 4k00:19CHANTHABURI, THAILAND-OCTOBER 1, 2018: People travel to visit The Cathedral of the Immaculate Conception is a Catholic church and is located in the city of Chanthaburi province in southeast Thailand. hd00:13La Plata, Buenos Aires Province, Argentina. September 5, 2018. View of the Plaza Moreno and the Cathedral of La Plata. The biggest Cathedral in South America. 4k00:14Delhi, India - November 28, 2018: The complex of buildings Humayun's tomb which is a World Heritage architecture. hd00:13ISTANBUL TURKEY - JULY 30: Tourists visit the Yeni Cami Mosque in Istanbul July 30 2011. The Yeni Camii, The New Mosque or Mosque of the Valide Sultan is an Ottoman imperial mosque located in the EminÃ¶nÃ¼ district of Istanbul, Turkey. 4k00:13ROME, ITALY - SEPTEMBER 2016: rome city summer day famous triumph arch of constantine panorama 4k circa september 2016 rome, italy.